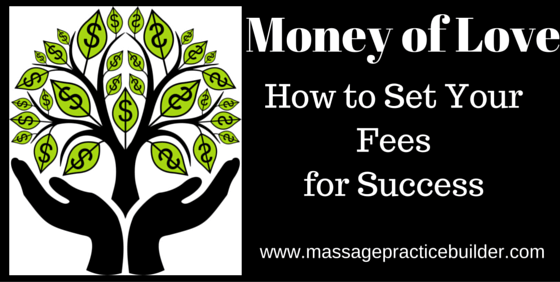 Setting Your Massage Fees – What to charge! Setting your massage fees is one of the most basic things yet the most complicated. You want to set your fees low enough so that you will get a steady stream of clients but not too high that you are not affordable by most people. You also want to be able to make a living, pay your bills and stay in business. Setting fees brings up so many unconscious beliefs and thoughts because of all of the things that we have been taught about money. Money is the one place in the world where we project all of our beliefs about our self worth and value. Money is the one thing that everyone in the world has to deal with. I was talking to a friend of mine who asked me if I knew any cheap massage therapists. She had been going to someone who was charging about $40-$50 an hour. That person apparently went out of business and had to go back into the corporate world to make a living. So was charging less than the national average of $65 a wise thing to do? Many think that charging less will get them more clients. They start out charging less for their services because they think that they are right out of massage school and not very good so they need to charge less and attract more clients. While they may not be as experienced the value of massage is really relative to each clients perspective and may not have anything to do with how good of a massage therapist you are. Charging less in the beginning may be a good incentive for people to come in. I recommend that as soon as your schedule is full to start charging more. Yes you may loose clients but the bottom line is that you need to be making enough to support yourself and your family. As you get busier you can be choosier about who you work on taking clients who pay you more. Some areas of the country where the cost of living is less may have lower fees for massage therapy services. One of the common things I hear massage therapists say is that they want to make their massage available to everyone so they set their rates really low thinking that is what will happen. It is scary to charge what you think is a lot especially in the beginning. Being available to everyone is a nice thought but sorry to say it just doesn’t work that way. If you are independently wealthy, don’t need to make a living, don’t care about having money for retirement, nice vacations and such things then you probably can charge low fees. I also realize that just saying low fees is not very exact because everyone has their own idea of low fees. By low fees I am meaning less than the going rate in your area just for purposes of this article. Your massage fees will reflect how you value yourself and your time. It is really the time that you are getting paid for. The caring that you give is actually Free and just comes with the massage. Massage therapists can get this confused easily thinking that they should not charge much because the work is so caring. Your time is what matters. It is time away from your family and life. Yes massage isn’t such an awful thing to be doing as far as work goes and being away from your family and rest of your life. I think the problem often becomes when you think that massage is your life that charging for your time becomes more difficult. Call as many other massage therapists as you can or research online what other massage therapists are charging in your area. Create a list of all of your business expenses. Create a list of all of your personal needs that need to be covered as part of your salary or draw from your business. Create a list of your dreams like vacations, travel, houses, cars. This isn’t about being material. It is OK to have desires for things. It is when they become more important than everything else that you get into difficulties. Figure out how many clients you need at week at what rate to get what you need to make. If you are just starting out setting your fees below the average will not necessarily get you the clients that you need. It has much more to do with than just price. What people want is the best massage ever. What people want is a solution to their problem (whatever that really is). You can create special introductory offers for a limited time to get people in the door to try your massage services. After that you will need to have an effective follow up in place and also have created trust with your intake and your massage so that people will want to come back in and send in all of their friends. When I first started out, I took over a practice in a health club from a guy who was charging a ridiculously low rate – something like $35 for an hour and even for 1989, that was unreasonably low. I immediately raised it to $45 and worked to get new clients. Each time I got to a place where my schedule was pretty full, I would raise the rates again. My accountant even advised me not to raise my rates because he thought I would lose too many people. The thing is that every time I raised my rates, I would lose a few people but I would also get new clients paying the higher rates making my income gradually increase each time! When you charge more than the average there is also another concept going on. People will perceive you to be a better massage therapist! People who are only looking for the cheapest massage are looking for just that. They may not have ever had a massage that really makes a difference. you would also be surprised at the number of people who do have a lot of money who look for deals and cheaper services. You will only be able to do a certain number of massages a day/week physically, mentally and emotionally. Most massage therapists do about 20 hours of massage a week. Some are able to do more. Since you are only able to do so many massages, you need to charge more to make a decent living. What is the value of a massage? What does it mean to people to be able to come in and get relief for their pain or problem? What is the value of providing regular weekly massage to someone and helping them heal their attachment, security and self-esteem issues? People will only pay you what they think you/massage is worth. The most difficult challenge in this business is teaching and showing the value of this work. What amount do you need to charge so that you do not feel resentful of the massage client? I have heard many stories of massage therapists feeling resentful and yes even to the extent that the person wanted to apply more pressure to the massage client than they could stand. While this is not a usual thing for a massage therapist it may arise when you feel resentful. Charge enough so that you are not expecting a tip. Some people will tip, some won’t. Depending on tips for income is not very helpful financially. If someone does tip think of it as a bonus not an essential part of your income. So how are you going to set your fees? If you have set your fees already, how did you come to what you are charging? After reading this it are you re-evaluating what you do charge? Also after setting your fees there is the next part of setting your cancellation and no show policies AND enforcing them! Your rates affect what both clients and colleagues will think of you. If you charge more than the norm, some clients may be put off, while others may think you must be offering something special for the extra charge. If you charge less than the going rate, some clients will be attracted to the bargain but may not value the work as much…. The amount you charge also affects how you feel about your work. Make sure that your fees are fair to you and that they take into account all of your expenses. Charge enough so that you won’t resent your clients. Also, make sure you don’t feel as if you are overcharging. If you are not comfortable with your fees, clients will sense it and feel uncomfortable too. This really could be called: Why Massage Therapists Earn Less. This is the book that started me on my path of healing my issues around money. It isn’t about creating a budget – it is about figuring out what you NEED to make to live comfortably and then figure out how to start making this. This book explains our love/hate relationship with money and why many choose to live in what Mikelann Valterra calls “Noble Poverty”. It changes the motivation to make money to focusing on making more rather than living with a budget which is restrictive and comes from a place of lack. Karen McCall is Mikelann Valterra’s Mentor and now partner in business, developing proprietary software for tracking money in a way that shows you how your money can really work for you and how to get a better handle on your income and expenses so you have money left at the end. It is not about budgeting, but about planning and figuring out how to make what you need and end the noble poverty. For several years, I have researched how to set my fees for providing massage. This article is the first TRUE guidance I’ve received. No other writer has been willing to stand up and give a straight answer to “What should I charge?! ?” Thank you, Julie, for telling us how to stand up and take charge!